This document relates to the end of the ‘radical war’ of 1820. After the Napoleonic War ended many working people were badly affected by the depressed economy, and felt unjustly treated by government and the ruling classes. Artisan workers such as weavers sought reform to bring about a fairer society and better rights for working people. The upper classes and government responded to this by recruiting men to the militia and stamping out all signs of uprising. The Radicals called for strikes in early April 1820, with action in various towns, including Stirling, Falkirk, Glasgow, Greenock and famously, Bonnymuir where on the 5th of April around 50 radicals were met by a party of militia. The radicals were outflanked and with many wounded, 19 of them were taken prisoner and removed to Stirling Castle. Amongst those seized at Bonnymuir were John Baird and Andrew Hardie whose names appear within the document. and Glasgow. On the 4th of August 1820 in Stirling the judge advised ‘To you Andrew Hardie and John Baird I can hold out little or no hope of mercy…as you were the leaders, I am afraid that example must be given by you’. Baird and Hardie were hanged in Stirling on the 8th of September 1820. They were interred at the Holy Rude cemetery at around 9 o’clock in the evening of the same day, in lair 513, and remained there until 1847 when they were removed and re-interred at Sighthill. Another 18 of their fellow accused were transported to the penal colonies of Tasmania or New South Wales. 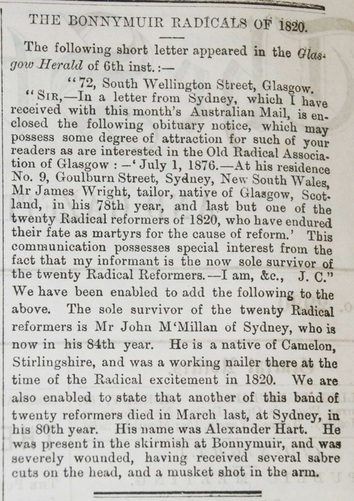 The Stirling Journal of 15th September 1876 carried a letter from the last surviving ‘radical’, John McMillan, living in Sydney and 84 years old at the time. At the time of the uprising he had been a nailer at Camelon. The letter refers to the recent death of two other ‘radicals’ in 1876, James Wright and Alexander Hart who both died at Sydney in their eighties. PD189 1 85. 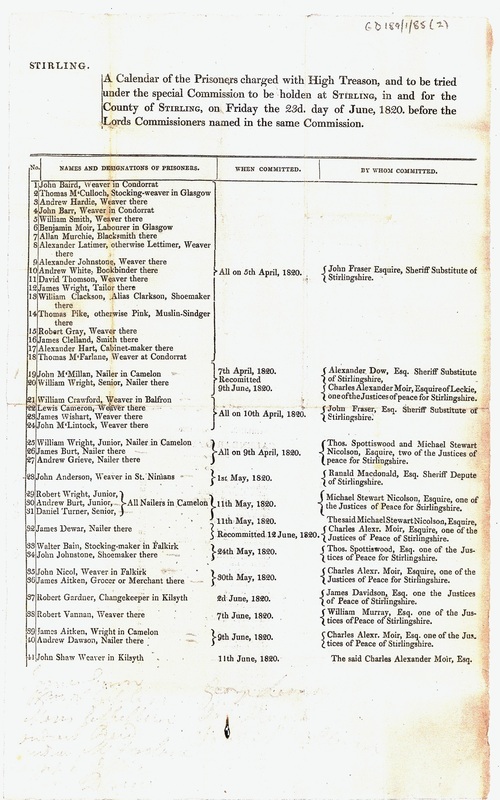 A calendar of the prisoners charged with high treason and to be tried under the special commission to be held at Stirling on Friday, 23 June 1820. Stirling Journal of 15th September 1876 carried a letter from the last surviving ‘radical’, John McMillan, living in Sydney and 84 years old at the time. Chosen by Jane Petrie Assistant Archivist. The Archive holds a wealth of information about this trial, the Radical War and its aftermath, in newspapers, Stirling Burgh material, church records and lairs plans. If you’d like to find out more, just ask any of the team at the Archive and we will be happy to help!